The QuickBooks Budgets & Forecasts Reports lets you see how well your company is performing and compare your actual revenues and expenses to your company’s budgeted amounts. You can use these reports to identify cost savings opportunities, possibilities for expanding on revenue sources and errors or omissions for incorrect accounting entries with these reports. You will find a list of QuickBooks Budgets & Forecasts Reports along with a description of the information contained in the report below. QuickBooks Budgets Reports give you information about your budgeted revenues and expenses. Budget Overview: The Budget Overview Report gives you your companies budgeted monthly revenues and expenses. Budget vs. Actual: The Budget vs. Actual Report lets you compare your company’s actual revenues and expenses to your company’s budgeted amounts, and gives you your variance, so you know whether you are over or under budget. Profit & Loss Budget Performance: The Profit & Loss Budget Performance Report is similar to the Budget vs. Actual Report, except that the actual revenues and expenses are compared to the budgeted amounts for the current month and current year. Budget vs. Actual Graph: The Budget vs. Actual Graph gives you a graphical display of your budget-to-actual revenue and expense variances. QuickBooks Forecasting gives you reports to assist with your company’s projections of future revenues and expenses. Forecast Overview: The Forecast Overview Report tells you what your company’s monthly forecasted income and expenses are for a particular time period that you select. Forecast vs. Actual: The Forecast vs. Actual Report gives you the budget-to-actual revenues and expenses or account balances compared to the forecasted or projected amounts. 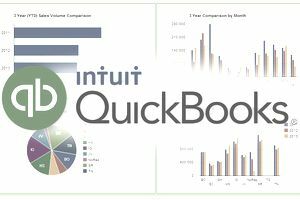 As one of the most popular accounting software programs for small businesses, QuickBooks has a comprehensive suite of accounting and financial reports to meet your reporting needs. Jobs, Time & Mileage Reports tell you about your job estimates, including time, the amount spent, and mileage for each job. Vendor & Payable Reports show you how much money your company owes to its vendors. Purchase Reports and Inventory Reports give you information about your company’s purchases and its open purchase orders, including inventory value, stock, and work-in-progress. Employees & Payroll Reports show you information about your employees and payroll expenses. Accountant & Taxes Reports give you information about your basic accounting reports and information needed to prepare your income tax return. Lists Reports show phone, contact, and customer lists that you will find useful.